With hindsight, I am struck by how Apple’s attention to user experience seemed such an extraordinary differentiating factor and became the main focus of my original article. 10 years later the primacy of experience-led smartphone design is taken for granted, even if its successful implementation remains unevenly distributed. The original iPhone emerged at a time when engineering-led culture dominated and, as a result, many smartphones were a clumsy combination of technologies released from the lab without sufficient user testing. For context, the average selling price (ASP) of a mobile handset in Q2 2007 was $132. Apple’s original price for the iPhone was $599 upfront, with the addition of a compulsory 2 year, high-end contract commitment to Cingular, the exclusive carrier partner for the launch. In contrast, other US smartphones at the time could be purchased for around $300 upfront with a contract. This, perhaps, explains my reservations over price. Indeed, mass market adoption of the iPhone only accelerated after a series of end user price reductions coinciding with the launch of the second and third generation iPhones, something I predicted in the original article. In Q2 2007, the global market for mobile handsets was 262.3m units, dominated by Nokia (38%), Samsung (14%), Motorola (14%) and Sony Ericsson (10%). In contrast, Apple stated its ambition was to sell 1m units in the first year. Of the $3.1 billion profits generated by the four market leaders in Q2 2007, Nokia earned $2.6 billion, 7.5x that of its nearest competitor Samsung. Nokia also shipped 50.8% of the total unit volume represented by these four manufacturers, totalling 100.8m devices, of which 13.9m were ‘converged’ smartphones running Symbian OS. 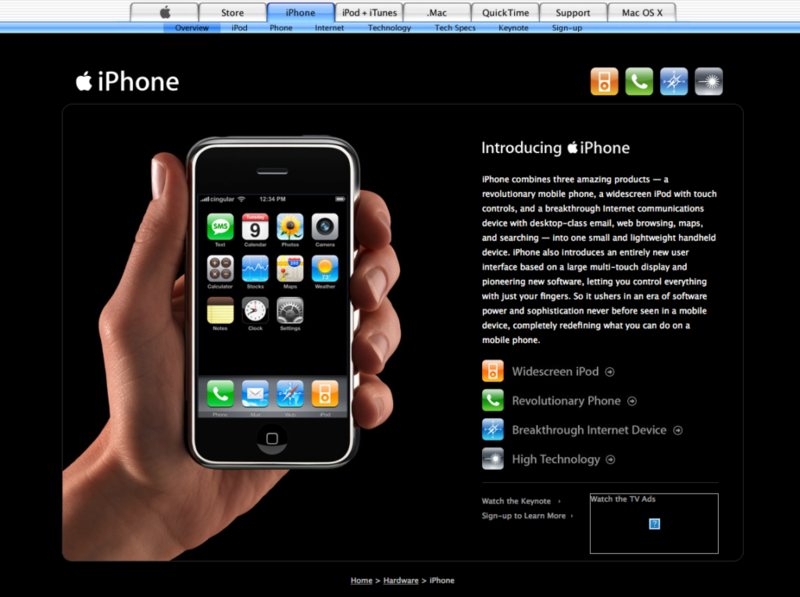 At launch in January 2007, Apple stated the iPhone would run a version of macOS X, and I refer to it as such in the original article. It wasn’t until March 2008 and the release of the iPhone SDK that Apple introduced the name iPhone OS and sought to diverge the platforms. Apple has set out a new vision for how users should interact with mobile devices. Its new mobile product has no numeric keys, calling buttons or navigation pad. All of the traditional pre-requisities of handset design have been swept away in favour of a touchscreen occupying virtually the entire face of the device. According to the company’s CEO Steve Jobs, Apple set out to revolutionise the phone. It has attempted to do this primarily through innovation in interface design. The iPhone has clearly been produced by a team which has stepped away from the conventions of mobile telephony, evaluated the core functions it wants the device to perform and set about building an interface best suited to those requirements. It is evident from the product’s design that music, photos, voice calling, web browsing and messaging are the key functions. Given the significant differences in the modes of interaction required by these applications, Apple has concluded a fully flexibile interface – as provided by its touchscreen – is the most effective way to deliver a great user experience. It is important to recognise that user experience is the key differentiator which will determine the success of the iPhone. Apple may have patented some of the technology relating to its touchscreen interface (enhanced to allow accurate finger input without needing a stylus), but there is nothing unique in the product’s specifications. The 2 megapixel camera, Wi-Fi, Bluetooth and music playback are readily available on less expensive handsets marketed by manufacturers with better channel distribution. Apple’s iPhone will have to succeed on the strength of its user interface, design and experience. Quite simply, it amounts to a question of whether users will find it easier to perform the key functions of music, calling, messaging, browsing and photography with the iPhone or with a more traditional handset? Evaluating the usability of the interface is currently impossible. 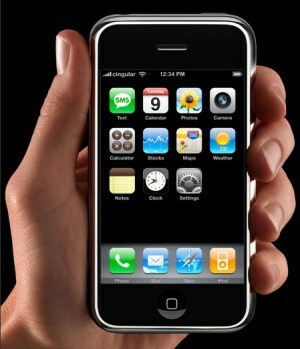 Apple has deliberately kept the project under close wraps and there will be no commercial availability until June 2007. Without seeing how the device operates day-to-day, any judgements would merely be guess work. However, the touchscreen concept is something we have been exploring for some time and we believe Apple is right to seek differentiation by offering a completely flexibile interface. There are also several other innovations which suggest Apple has paid close attention to the user experience enhancements which can make or break a product. It has included a range of sensors, used to detect light conditions, proximity and orientation – the device then adjusts its settings accordingly. For instance, turn the device into landscape orientation and the screen immediately flips to reflect this. Hold the device to your ear and it will switch off the touchscreen. This kind of contextual awareness is key to good experience. Apple has also worked closely with its service partners: Google provides integrated search and mapping, Yahoo is offering free push email and mobile operator Cingular – which will be the exclusive provider in the US – will be delivering the core network functionality to enable these applications. iTunes, calendar and contacts integration is expected to be excellent. Other interesting features include the 4 and 8 Gb storage capacities, the fact it runs Mac OS X and that it will only support GSM and EDGE in the initial version. It will be priced at USD 499 and USD 599 for the 4 and 8 Gb version respectively when it launches with Cingular in the US. A 3G version is planned for European markets in Q4 2007, with Asia to follow in 2008. We like the iPhone. We think Apple has done a lot of groundbreaking work to produce a user experience better suited to the emerging generation of media hungry mobile customers who use and share information in a very dynamic ways. This is a product for the user who instant messages sitting in front of the TV, Googles words while they are reading magazines and shares photos like gossip. Media and communications are becoming intertwined in a complex new landscape and the iPhone, through interface innovation, is designed to reflect these new requirements. However, we have some concerns. The first is whether the variant of OS X which powers the iPhone will be robust enough for telephony and sufficiently attractive for third party developers to innovate new applicactions. Second, we fear the political climate of the mobile industry will prevent Apple from achieving strong enough distribution – the product represents a direct challenge to handset manufacturers and operators who have ambitions of controlling the music, browsing and video experience. It may be the iPhone only succeeds in a second or third iteration which is able to take advantage of disruptive trends in emerging mobile broadband networks. Lastly, it is expensive. At USD 599 with a 2 year contract, this represents a major purchase and a level of investment considerably higher than an iPod. The expectation surrounding this launch has been unprecedented and with good reason: Apple has a history of producing exceptional products that change the way people interact with the digital world. In launching a communications product, it is trying to go a step further and change the way we interact with each other. By focusing on making key features easier and giving people a clearly differentiated choice over rival products, we think Apple has contributed significantly to enhancing the user experience of mobile services. Marek, I think you’re right on that the major differentiators are in the UE area, as opposed to a unique feature set or technology (it’s not a PDA or smart phone). I think the biggest win is that Apple has been able to shake up the oem/carrier relationship and get some true innovation to happen. Like Jobs said in his keynote, “every software company should make their own hardware.” (I’m paraphrasing). This is something Microsoft is learning from (Xbox, Zune) and is an area where the mobile industry could make some strides. My initial reaction to the iPhone announcement is over at Idlemode.